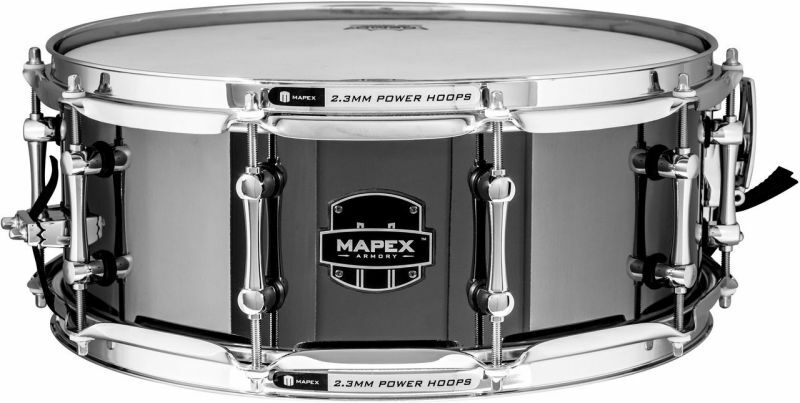 The Mapex Tomahawk's shell is fitted with a piston strainer and vertical throw-off that enable quick, smooth operation and prevent snare wire tension changes during play. The precision tooled solid steel Armory Tube Lugs deliver greater tuning accuracy and shell stability while giving the drum an elegant yet modern appearance. Made with a 1mm stainless steel shell, the Armory Series Tomahawk Snare from Mapex has penetrating accuracy and long range projection. The focused power of its rimshot is resonant. The steel shell features a rounded 45-degree bearing edge for focused brightness with plenty of volume. Mapex's impressive SONIClear bearing edge enables skins to sit perfectly flat and give you a head start on your tuning. What this means for the player is less time tuning and more time playing.